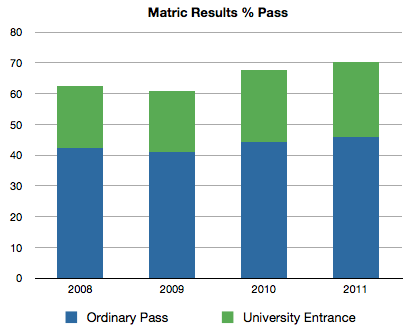 South African students will breathe a sigh of relief tomorrow morning as the 2011 Matric results are released. This evening we got the summary data, and in general the numbers are good. 70,2% of state-school candidates passed (up 2% from 2010) and 24,3% gaining university entrance (up just under 1%). Students attending independent schools (which sit the equivalent IEB tests) performed exceptionally well. Of the 8 285 candidates, 98,4% passed and 85,5% obtained university entrance. On the surface these statistics paint a picture of rapidly improving standards. However, given the pressure on government to both prove the value of the “new curriculum” and improve performance - especially in rural South Africa - one must ask the poignant questions. Is the difficulty of final examinations being gradually reduced to improve performance? Are marks being adjusted upwards to compensate? And, critically, are school-leavers educated at a level to indeed enter university or adequately equipped find a job after school? Update: NGO Equal Education highlights a concerning reduction in the number of candidates: 496 090, down 41 453 from 537 543 in 2010. They also note that 923 463 learners started Grade One in 2000 indicating an approximate 46,3% drop-out rate over twelve years of schooling.